A Chestnut-breasted Coronet Hummingbird sips nectar from a flower in the Ecuadorian cloud forest. 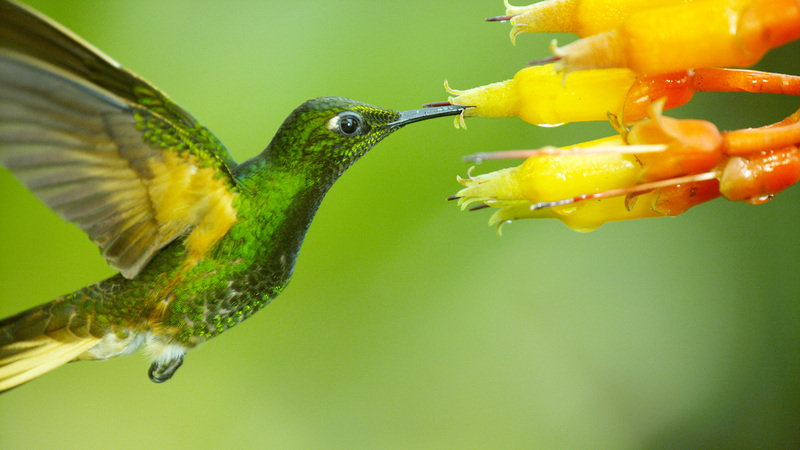 From NATURE: SUPER HUMMINGBIRDS on PBS. Photo courtesy Ann Johnson Prum/©THIRTEEN Productions LLC. The cover story of Sunday’s Parade magazine (10/09/16) caught my eye. It didn’t lure me in with revelations about the Brad Pitt-Angelina Jolie break-up or stomach-turning tweets by Donald Trump. Far from it. Simply entitled Awe, the article goes on to encourage “the feeling”… where and how we experience it, and why it might actually be the “secret to good health and happiness.” You don’t need the latest cell phone, Fitbit or self-driving car to capture the bliss associated with Awe. Better yet… unplug your devices, step outside your door and explore and appreciate firsthand the beauty and wonders of nature, the miracle of Planet Earth and vastness of our universe, or the sublime achievement of great art, architecture, literature and music…and share those awesome experiences with friends and family. A Green-crowned Brilliant Hummingbird guards his turf as another hungry hummer interloper tries to take a sip of precious nectar. From NATURE: SUPER HUMMINGBIRDS. Photo courtesy Ann Johnson Prum/©THIRTEEN Productions LLC. If you live in the Americas and have a flower garden or have passed through one at some point in your life, you’ve possibly met up with one or two hummers. However, they move so fast and are so small (the world’s smallest birds! ), chances are you were unaware of their presence. That is unless you’ve mounted a specially designed hummer feeder outside your window. Thanks to the marvels of high-speed photography, Super Hummingbirds literally brings us eye-to-eye with various colorful species of hummingbirds, a rare occurrence in everyday life. We are privy to their intimate mating, birthing, nest-building and parenting rituals, as well as their amazing aerial feats. They can fly backwards, upside down and hover in mid-air, with wing speeds of up to 80 times per second. The film also introduces the work being done with hummingbirds by ornithologists, behavioral ecologists and evolutionary biologists based at such institutions as UC Berkeley, the University of New Mexico and Cornell. 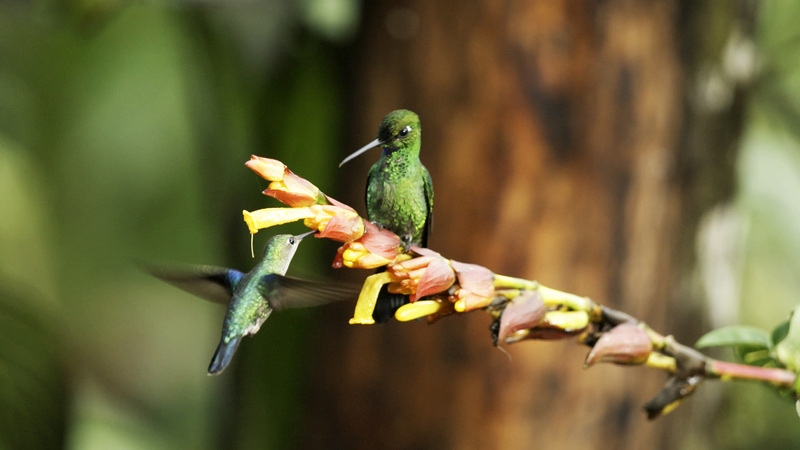 Marvelous footage highlights hummingbird feeding studies conducted by Dr. Alejandro Rico-Guevara in Colombia; the astounding hummer high altitude oxygen comparables tabulated in the Peruvian Andes by Dr. Christopher Witt; and the flashy hummer mating dances filmed by Dr. Marcelo Araya-Salas in the Costa Rican rain forest. 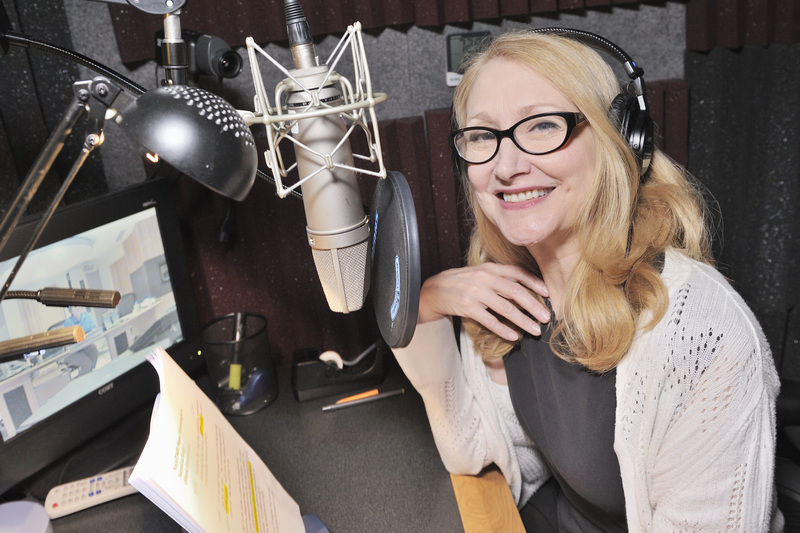 Actress Patricia Clarkson narrates NATURE: SUPER HUMMINGBIRDS on PBS. Photo courtesy Joseph Sinnott/©2016 THIRTEEN PRODUCTIONS LLC. Fast, feisty and focused on fueling up at the nearest nectar-rich flower, hummingbirds may be small, but their high-energy lifestyle makes extraordinary demands on their tiny bodies. Hence, their waking, sleep and feeding cycles are unique to the species and quite remarkable. Significant pollinators (pollen sticks to their heads as they hover and draw nectar from flowers), hummingbirds are also noteworthy for their adaptability to new terrain, climates and altitudes. This entry was posted in TV and tagged Alejandro Rico-Guevara, Ann Johnson Prum, Birds, Christopher Witt, Janet Hess, Marcelo Araya Salas, NATURE, Nature & Wildlife, Patricia Clarkson, PBS, Super Hummingbirds. Bookmark the permalink.